Rifle bipods have been gaining in popularity in the last 20 years, and it’s easy to understand why. A bipod can be of great help in a tactical scenario, and it can dramatically improve your accuracy. Finding the best bipod can be difficult in today’s crowded market, especially if you don’t know what to look for in a model. Bipods come in a lot of different price ranges, and the differences between models might not be obvious. In the following article, we present the best AR 15 Bipods of 2019, and we reveal their pros and cons. Further, in the article, we explain what to look for in a rifle bipod, and how to find the right one for your needs. Length : 6" to 9"
Length : 6" to 8.5"
This bipod attaches itself to the Picatinny rail directly, without using an adaptor. If you don’t have a Picatinny rail mounted on your rifle’s forearm, you can buy the Caldwell Adapter Plate and attach it quickly. Quick Lock Mechanism – This bipod’s quick lock mechanism will allow you to attach it to any rifle with forearm Picatinny rails without using a tension knob. You just use a lever to change the bipod from one firearm to another. Pivots – The bipod pivots smoothly over a wide radius, without affecting the legs. This will allow you to acquire your targets quickly. Heavy – This is a solid bipod, but it might be too heavy to carry around all the time. However, the weight can be an advantage because it makes the bipod sturdier. 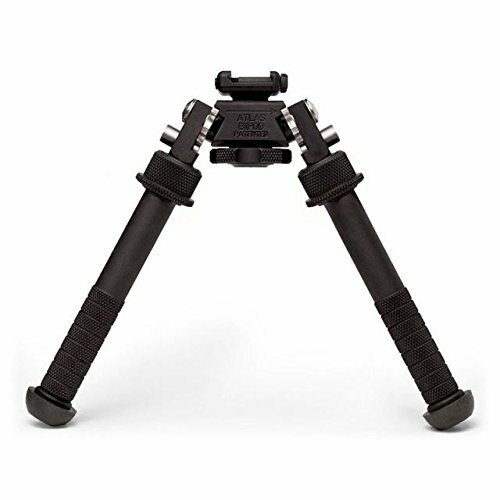 The UTG tactical bipod comes with rubberized feet that will increase its stability on a lot of different surfaces, such as gravel, dirt, or even wet stones. The bipod has a heavy-duty metal construction that makes it more durable than other models. This bipod comes with both a Picatinny rail and a swivel stud mounting base, so you can use this combination to attach your rifle to it directly. The swivel stud uses a threaded pin to attach to the rifle’s original stud. The bipod allows the rifle to rest at a height of 8 – 12.4 inches, so you can use it while shooting prone or seated. High-Quality Materials – All the materials used for this bipod’s construction have a good quality. The legs can be locked in place using a thumbwheel, and the rubberized feet will keep the bipod stable on slippery surfaces. Perfect Height – The bipod’s lowest position is perfect for the AR 15. 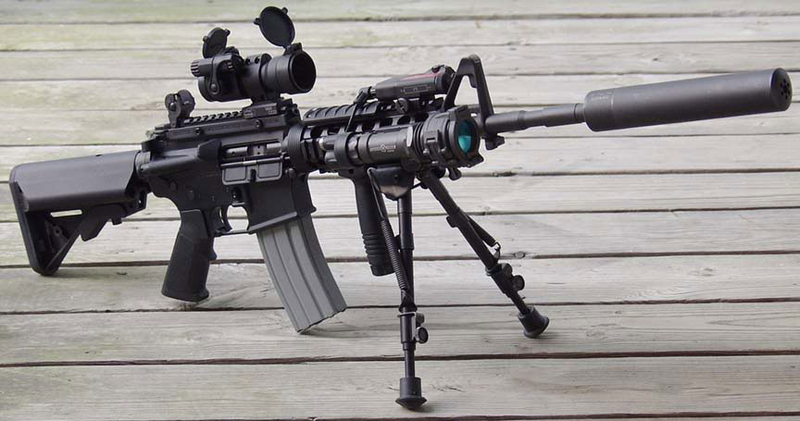 Most people use 30-round mags on their ARs, and this bipod is high enough for one to fit in its lowest position. QD Lever Comes Loose – Some customers complained that the QD lever comes loose after you shoot. While this is true, you can simply tighten it with the provided Allen wrench, so it won’t be so loose, to begin with. This bipod is slightly lighter than other models on the market, but that doesn’t affect its durability. The frame is very strong, despite its lower weight. The bipod comes with a lifetime warranty, so you can be sure to use it a long time. Unlike other bipod models, this one doesn’t attach directly to a Picatinny rail, but through an adaptor. Luckily, the adaptor produced by the same manufacturer is cheap, and it’s easy to connect both to the rifle and the bipod. Reliable Deployment – The bipod’s spring-loaded legs will deploy easily all the time. The legs are well-built, and adjusting their height is easy and straightforward. Solid – This bipod is solid. You can use it reliably for a long time without worrying it might break down someday. Not Good For Prone Shooting – The bipod is tall, and that can make prone shooting difficult. However, the height of the bipod makes it perfect for bench shooting. If you’re looking for a bipod you can use with your AR 15, but you’re not willing to spend hundreds of dollars on one, you should take a closer look at this model. This rifle bipod is one of the cheapest you’ll find on the market, but it also has a strong build. The bipod can attach to your rifle using the existing swivel stud. The manufacturer also includes a Picatinny rail mount in the package. If your rifle doesn’t have a Picatinny rail on the forearm, you can buy the compatible Blackhawk adapter. Looks Great – Despite its low price, this bipod looks just like the models that are ten times more expensive than it. If you care about appearances, you won’t have to worry when you’re using this bipod. 5 Length Settings – The bipod’s legs can be individually adjusted to one of the five existing length settings. Adjusting the legs individually will allow you to improve its stability on uneven ground. No Instructions – The bipod doesn’t come with an instructions manual, and the plastic protection on the mounting platform can really throw people off. One of the downsides some bipods have is that they’re not tall enough to accommodate 30-round mags or modified stocks when you’re shooting from the prone position. Well, if you use the UTG 6 -8.5” bipod, that won’t be a problem any longer. 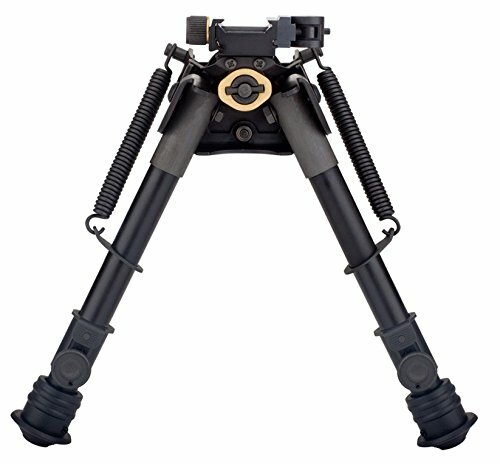 This bipod comes with a dual mounting system. You can either attach it to your rifle using the swivel stud mount or use the Picatinny mount to enjoy the Quick Detachable lock. 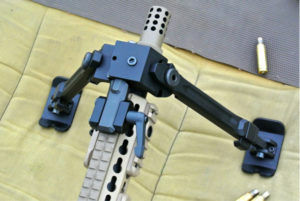 If your rifle doesn’t have a Picatinny rail on the forearm, you can use the compatible SUGEAR rails. Heavy Duty – The bipod is a good fit if you’re looking for something that can take a beating. The non-slip foot pads and the full metal construction make it perfect for heavy-duty use. Heavy – This bipod is heavy, and some people might consider it too heavy to carry around. If you’re looking for a bipod you can throw in the back of your car and take to the range, the weight shouldn’t be a problem. This bipod comes at a really cheap price but it can hold up its own when compared with more expensive models. The bipod is made out of hardened steel, so it will withstand the recoil without any problems. The loaded spring mechanism is easy to deploy and adjust, and you can set up the bipod quickly. 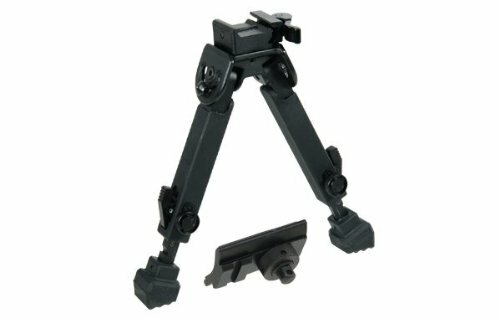 This bipod doesn’t come with a swivel stud mount or a Picatinny mount adapter, so you’ll have to buy your own if you don’t own any already. 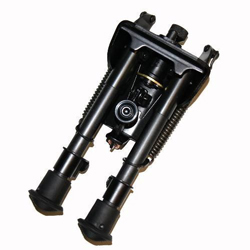 We recommend you buy these ones because they were specially designed to match this bipod. Cheap – This bipod is cheap, and you will spend only a fraction of the price you would pay for other models. Strong – Despite its low price, this bipod is really strong. You will be able to lean into it when you’re taking the shot without worrying that the legs will fold. No Instructions – This bipod doesn’t come with an instructions manual. This might be a problem, especially if you don’t have any previous experience with using a bipod. If you’re looking for a state-of-the-art bipod, you should look at the AccuShot Atlas. This bipod has a very strong build, and it can withstand anything you throw at it. The bipod can be attached to any 3 grooves Picatinny rail. If you don’t own a forearm Picatinny rail, you can pair this bipod with the Blackhawk rails available here. 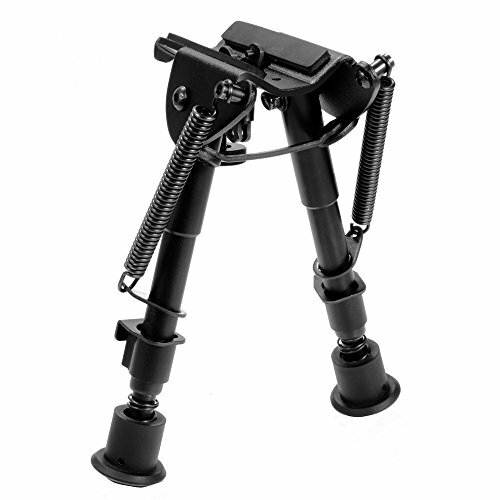 This bipod uses stainless steel legs that can be adjusted to five different steps. The lowest height is 4.75”, and the highest is 9”. The legs are very sturdy, and you can lean on them when shooting. Light – Despite its sturdiness, the bipod is lightweight. This will allow you to carry the bipod every time you go to the range without any kind of problems. 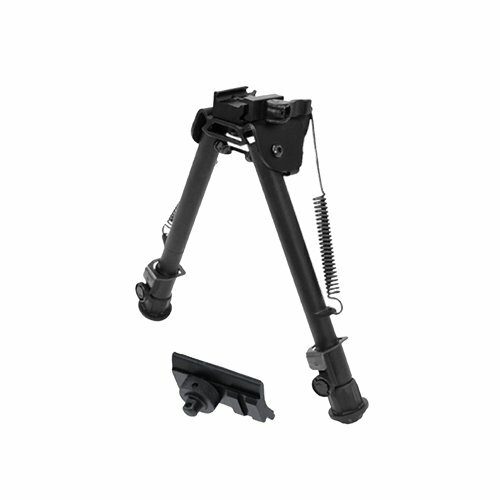 Pivots – This bipod can pivot smoothly in a narrow radius. This will allow you to acquire your targets faster without interfering with the rifle’s height. Costly – Even though this is a high-quality bipod, it comes at a steep price. However, if you’re planning on using the bipod in tactical situations, it will be worth the extra price. Finding the best rifle bipod might be more difficult than you expect, especially if you take into consideration how many different models are available on the market nowadays. In the following section, we explain what characteristics make a bipod good, and how to find the best model for your AR 15. Probably the most important characteristic of a bipod, stability can be affected by a large number of factors. Weight – The weight of the bipod can greatly influence its stability. It’s true that usually heavier bipods are more stable than lighter ones, but weight alone does not make a bipod more stable. 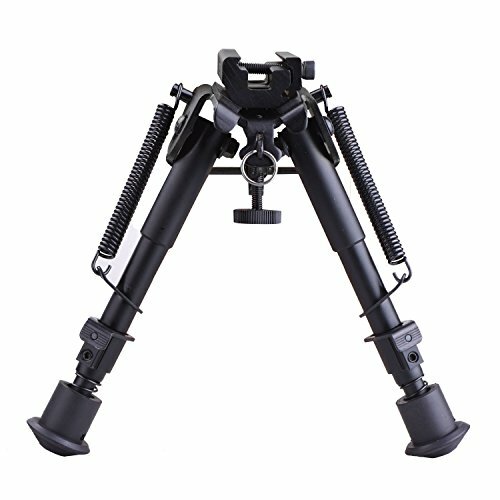 Legs – All bipods come with adjustable legs. Most models offer five different heights, so you can find the one that suits you best. If you have to place the bipod on an uneven surface, it’s very important to have legs that can properly lock in place. Feet – Most manufacturers use rubberized feet for their bipods. Rubberized feet are great because they enhance the bipod’s stability. They can be used with good results when you have to place the bipod on an uneven surface. They are also very good at stabilizing the bipod when it’s placed on a slippery surface, such as dirt or gravel. As you can see, the bipod’s stability can be affected by many factors, and all of them are interconnected. Having a stable bipod is very important because an unstable one will only interfere with your accuracy. The bipod’s height is also a very important factor you have to take into consideration, especially if you use modified stocks or extended mags. Some bipods are shorter than others, and they won’t be tall enough to fit an extended mag. There’s another aspect you have to take into consideration when you choose the bipod’s height, and that’s your shooting position. If you want to use the bipod while shooting from the prone position, you might want to buy a shorter model. If on the other hand, you want to use the bipod while shooting from the seated position, you might be better off buying a taller model. But in both cases, be sure that your new bipod will fit in your AR Case. The height of the bipod can also influence its balance. Some models have a great balance when the legs are extended to their first or second positions, but they begin to lose some of that balance when the legs are extended over the third notch. Bipods are not very complicated, but some manufacturers succeed in making them so. If you want to buy an easy-to-use bipod, look for a model with a simple but practical design. An important feature you should look for is the attachment platform. If your rifle is not equipped with a Picatinny rail, it might be better if you installed one. To use a bipod, you will need the Picatinny rail attached to the rifle’s forearm. This location will make the Picatinny rail suitable for other uses as well, such as improved grips or flashlights. Some bipods come with a small Picatinny rail, so you won’t have to spend extra money on one. Quick Attachment/Detachment System – This will allow you to attach the bipod to the rifle without wasting time, and without having to use several tools to do it. Detaching the rifle from the bipod quickly might be more important than attaching it to the mounting platform, especially if you’re planning on using the bipod in field conditions. Some bipods come with Quick Detach (or QD, for short) systems. These systems will allow you to detach the bipod from the rifle very quickly, so you could change your shooting position fast in tactical situations. Some models use a lever to detach the bipod, while other use knobs. 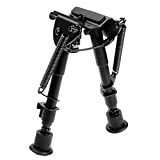 Adjustable Legs – As we stated before, most bipod models nowadays come with adjustable legs. But not all of them are easy to adjust, and that can really affect your shooting experience. Good bipods come with legs that are adjustable both in height and in their angles. 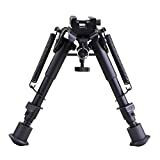 This will help you find a stable position if you have to place the bipod on an uneven surface, and it will also help with moving the bipod from one place to another. Adjustable legs are not only easy to setup, they are also easy to retract. Some of them come with push-buttons that help with the retraction, while others rely on knobs for the same operation. If you have to use an Allen wrench to adjust the height of the legs, you’ll be wasting precious time every time you visit the range. Spring powered legs are very popular nowadays, and most manufacturers use them in their designs. One of their main advantages is that they’re really easy to set up. They use notched legs, and you can simply pull the spring and lock it in a notched hole. The disadvantage of using this type of legs is that they are not very versatile, and they might prove to be an inconvenience if you try to use them on uneven surfaces. Twist knob legs are also easy to use, and they’re more versatile than spring ones. When you want to modify the bipod’s height, you simply pull it until it reaches the desired length and lock it in place using the knob. The downside of using this type of legs is that it usually takes more time to adjust the bipod’s height. Spring powered legs with knobs are less popular, but they can be very effective. If you’re in a hurry, you can use the spring system to set up the bipod quickly. If you’re not in a hurry, and you want to make small and precise adjustments to the bipod’s height, you can use the knob system. This type of legs brings together the best of the previous versions, and they can dramatically improve your shooting experience and accuracy. Proper Height – Depending on your preferred shooting style and position, you can choose bipods with a different height. Bipods that extend from 6 – 9” above the ground are the ideal choices for shooters who like firing from the prone position. The low stance will grant you a higher accuracy, and it can provide a better cover in tactical situations. However, this shooting stance might not be very comfortable, and some people might have problems maintaining it for an extended period of time. One of the disadvantages these bipods have is that they might not offer enough space to fit an extended mag or a modified stock. Bipods that extend between 9 – 13” are better suited for the supported prone, crouching, or sitting shooting stances. They can be used very effectively at the range, but they are also important for tactical scenarios. They can be used to keep the rifle above the cover you’re hiding behind. As you could see in our short reviews, bipods can come in a large variety of prices. Some of them are very cheap, and others can be very expensive. If you want to find a good bipod, you have to think about how you intend to use it. If you want to use the bipod only at the range for recreational purposes, you can buy the cheapest models and still have a blast. 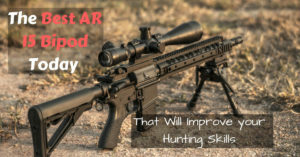 True, they might take longer to set up, and they probably won’t last as long as other models, but you can still use them at the range without any problems. If you intend to use the bipod for hunting or tactical scenarios, you might be better off buying a more expensive model. These models can be more durable, and they might be easier to set up properly. Keep in mind that you might also need to buy a Picatinny rail if you don’t have one. As you could notice in our bipod reviews, some models can swivel, while others can’t. The swivel might not be very important if you plan on using the bipod at the range, but it certainly is if you plan on using it for hunting or in a tactical scenario. Most models come with a limited swivel capacity, but others offer a wider swivel radius. This will improve your shooting experience, and it will allow you to acquire your targets faster. Now that you read our short list of top AR 15 bipods and the short buying guide, you can make an informed decision on which model is the right one for you. Keep in mind that when you’re buying a rifle bipod, more expensive is not always better. You should try to find the best rifle bipod for your needs, not the most expensive one. So you can spend your rest of the money for an AR Laser or a red dot sight or you can just simply buy an AR15 sling. If you’re planning on using the bipod only at the local range, buying the most expensive model might not be justified. Even the cheap models are good at supporting your firearm on the leveled ground, and they’re sturdy enough to support your weight if you push them.